I almost always sew exclusively for myself, but I’ve felt so generous lately, I’ve decided to make my husband something. I have been wanting to sew with waxed canvas for a while, and the Portside Travel Set by Grainline Studios was the perfect project to try this fabric. I looked at fabric that came pre-waxed, but I elected to wax my own fabric because I found some heavyweight canvas duck cloth and matching quilting cotton for the lining on sale at Joanns. Hardware and cotton webbing were purchased on Etsy. I used Otter Wax (purchased on Amazon). In case you are wondering, Otter Wax contains beeswax and plant-based ingredients. Not otters! There are several methods you can use to apply the wax. A quick You Tube search on “how to wax fabric” will show you there are other ways to apply the wax successfully without following Otter Wax’s directions. However, I elected to not follow any of these directions. I cut out my pattern pieces as usual, and then, I applied the Otter Wax to each piece by rubbing a light coat of wax onto the fabric. Then, I ironed the fabric using a press cloth to protect my iron from getting waxy. Repeat this process until waterproof. Towards the end of waxing all of the pieces, the press cloth got saturated with wax and wax ended up getting onto my iron, but it wiped off very easily while the iron was still hot. If you don’t have fabric to use as a press cloth you can apply wax to the right sides of each pattern piece, arrange them wax sides together and then iron. Be sure to cover your ironing board unless you want all your clothes to be covered in wax henceforward! I used scraps of duck cloth and it worked great. Waxing all three bags used two 2.25oz bars of Otter Wax. 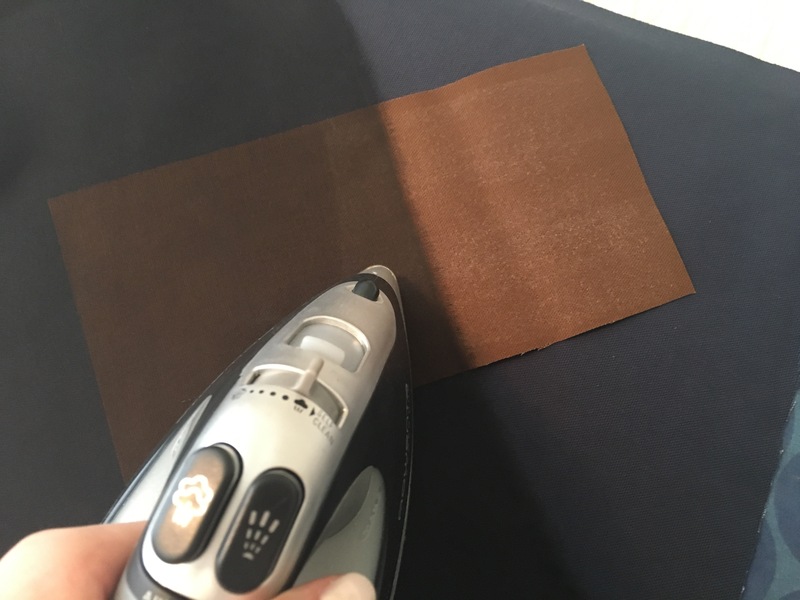 After ironing, your pieces are ready to sew immediately. The newly-waxed fabric does not need 24 hours to cure, unlike other methods. I sewed up the bags using a denim needle, and there is no waxy buildup inside my machine or even on the needle! The Portside duffel is huge, and perfect for a weekend-long trip. Also, the dopp kit (aka toiletry bag) is roomy too (see photo at left). I stuffed 10 pairs of socks in it for the photo! Both the duffel and the dopp kit are lined with navy and white arrow-print fabric. Only a few minor modifications were made to the pattern. One, I only used 1.5″ webbing instead of using two sizes, and two, I used a buckle slider instead of two d-rings on the duffel strap. I am so jealous of my husband’s new luggage set! I need to make one for myself now. In the future, I’ll try lining the dopp kit with oilcloth or vinyl so make-up spills can be wiped up easily. Also, I will make the pouch out of clear vinyl for a TSA-friendly liquids bag! Maybe I’ll start seeing other Portside Travel Sets at the airport soon! Happy sewing!